The Apicomplexa (also called Apicomplexia) are a large plastid called an apicoplast, and an apical complex structure. The organelle is an adaptation that the organism applies in penetration of a host cell. The name of the taxon Apicomplexa derives from two sporozoite. The Apicomplexa comprise the bulk of what used to be called the Sporozoa, a group of parasitic protozoans, in general without flagella, cilia, or pseudopods. Most of the Apicomplexa are motile however, by use of a gliding mechanism that uses adhesions and small static myosin motors. The other main lines were the Ascetosporea (now in Rhizaria), the Myxozoa (now known to be derived from animals), and the Microsporidia (now known to be derived from fungi). Sometimes, the name Sporozoa is taken as a synonym for the Apicomplexa, or occasionally as a subset. A further group of spherical organelles is distributed throughout the cell rather than being localized at the apical complex and are known as the dense granules. These typically have a mean diameter of about 0.7 μm. Secretion of the dense-granule content takes place after parasite invasion and localization within the parasitophorous vacuole and persists for several minutes. The main difference between the coccidians and the gregarines is in the gamonts. In the coccida these are small, intracellular and without epimerites or mucrons. In the gregarines, these are large, extracellular, and possess epimerites or mucrons. A second difference between the coccidia and the gregarines also lies in the gamonts. In the coccidian, a single gamont becomes a macrogametocyte, whereas in the gregarines, the gamonts give rise to multiple gametocytes. 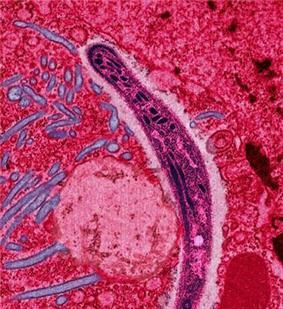 Many of the apicomplexan parasites are important pathogens of human and domestic animals. In contrast to genome sequencing. The availability of genome sequences provides a new opportunity for scientists to learn more about the evolution and biochemical capacity of these parasites. The predominant source of this genomic information is the EuPathDB  family of websites, which currently provides specialised services for Plasmodium species (PlasmoDB), coccidians (ToxoDB), piroplasms (PiroplasmaDB), and Cryptosporidium species (CryptoDB).> One possible target for drugs is the plastid, and in fact existing drugs such as tetracyclines, which are effective against apicomplexans, seem to operate against the plastid. All members of this phylum are parasitic and evolved from a free-living ancestor. This lifestyle is presumed to have evolved at the time of the divergence of dinoﬂagellates and apicomplexans. Further evolution of this phylum has been estimated to have occurred about . The oldest extant clade is thought to be the archigregarines. The first Apicomplexa protozoan was seen by Antonie van Leeuwenhoek, who in 1674 saw oocysts of Eimeria stiedae in the gall bladder of a rabbit. The first member of the phylum to be named (by Dufour in 1828) was Gregarina ovata in earwigs. Since then, many more have been identified and named. During 1826–1850, 41 species and six genera of Apicomplexa were named. In 1951–1975, 1873 new species and 83 new genera were added. The older taxon Sporozoa was created by Leuckart in 1879 and adopted by Bütschli in 1880. Through history, it grouped with the current Apicomplexa many unrelated groups. For example, Kudo (1954) included in the Sporozoa species of the Ascetosporea (Rhizaria), Microsporidia (Fungi), Myxozoa (Animalia) and Helicosporidium (Chlorophyta), while Zierdt (1978) included the genus Blastocystis (Stramenopiles). Sporozoa is no longer regarded as biologically valid and its use is discouraged, although some authors still use it as a synonym for the Apicomplexa. More recently, other groups were excluded from Apicomplexa, e.g., Perkinsus and Colpodella (now in Protalveolata). ^ Saffo, M. B., McCoy, A. M., Rieken, C., & Slamovits, C. H. (2010). Nephromyces, a beneficial apicomplexan symbiont in marine animals. Proceedings of the National Academy of Sciences, 107(37), 16190-16195. ^ Leuckart, R. (1879). Die menschlichen Parasiten. 2nd ed. Vol. 1. ^ Bütschli, O. (1880-82). Dr. H.G. Bronn's Klassen und Ordnungen des Thier-Reichs. Erster Band: Protozoa. Abt. I, Sarkodina und Sporozoa, . ^ Perez-Cordon, G. et al. Donax sp. in bivalves of the genus BlastocystisFinding of . Rev. peru biol. 2007, vol. 14, n.2, pp. 301-302.